2 to 14 PERSON FISH HOUSES Extensive Road System to Hot Spots State Snowmobile Trail On The Property Great Group Outing! 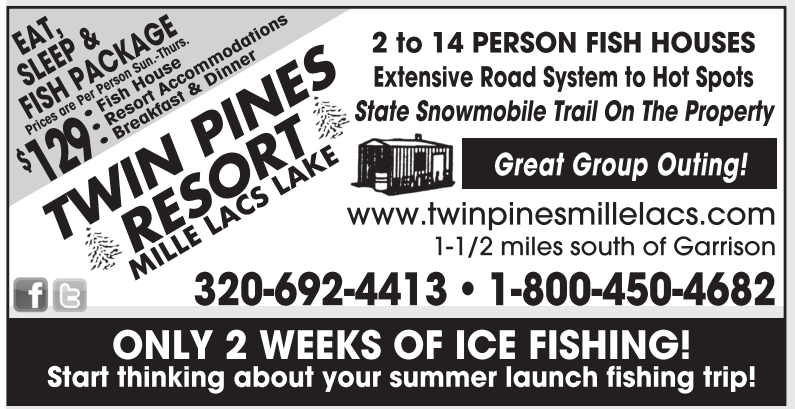 www.twinpinesmillelacs.com 1-1/2 miles south of Garrison 320-692-4413 • 1-800-450-4682 ONLY 2 WEEKS OF ICE FISHING! Start thinking about your summer launch fishing trip! ONLY 2 WEEKS OF ICE FISHING! Start thinking about your summer launch fishing trip!